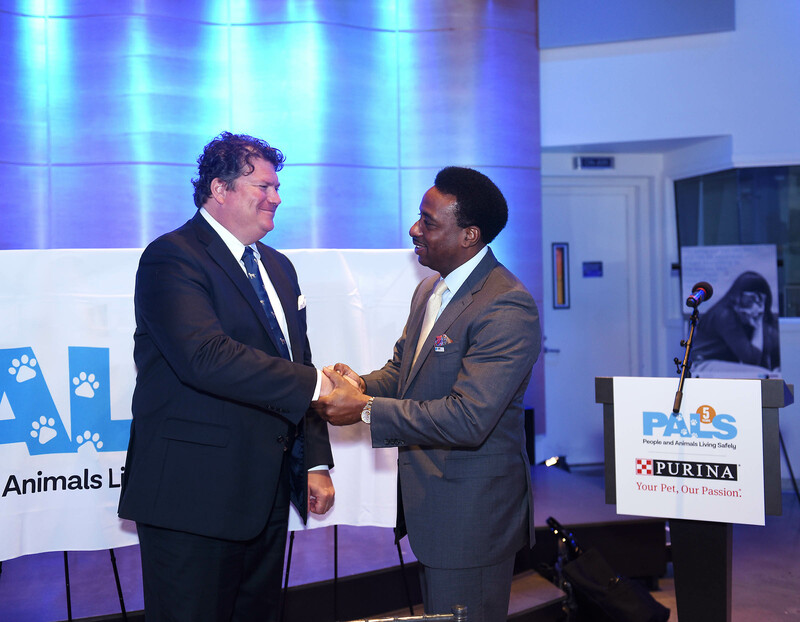 NEW YORK, May 30, 2018 /PRNewswire/ -- Urban Resource Institute (URI), a leading provider of domestic violence shelters and services in New York City, and Purina, a producer of high-quality nutrition for pets for more than 90 years, today announce the development and construction of PALS Place, a seven-story emergency domestic violence shelter in Brooklyn. 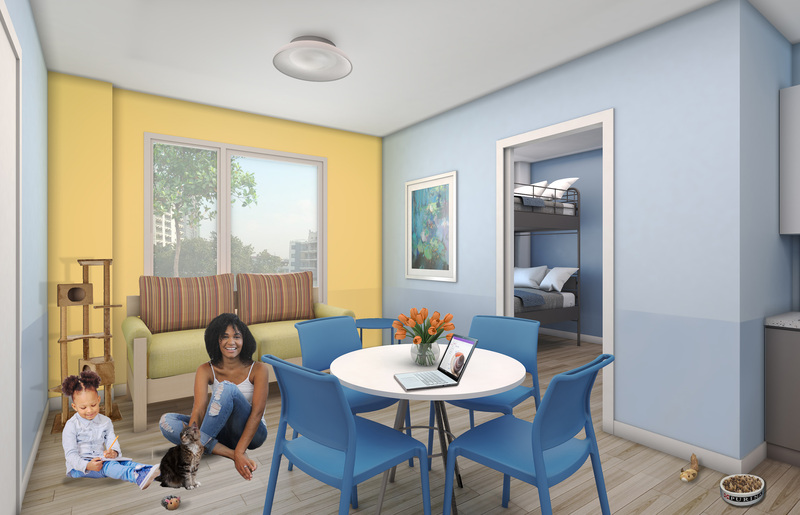 PALS Place will be the first-ever domestic violence shelter of its size in the country specifically designed and outfitted for survivor-pet co-living, providing 30 apartments where up to 100 survivors, whether individuals or families, can heal together in safety with their pets. The shelter will open in the fall of 2018. According to research cited by the National Coalition Against Domestic Violence, more than 70 percent of domestic violence victims report that their pets were either threatened, harmed, or killed by their abuser. However, only about 3 percent of domestic violence shelters in the United States permit pets, forcing individuals and families to make the nearly impossible choice of abandoning their pets to enter shelter, or remaining in an unsafe environment and risking further abuse. In fact, 48 percent of domestic violence victims stay in abusive situations because they don't want to leave their pets behind. "Domestic violence impacts every member of a household – and that includes pets. PALS Place is about providing survivors of abuse and their pets a safe place to live and heal together, and eliminating the impossible choice of escaping abuse or protecting your pet. But it's also about tapping into the power of the human-pet bond to create an environment that's even more conducive to healing and recovery," said Nathaniel M. Fields, president and CEO of Urban Resource Institute and Center Against Domestic Violence. "We are thrilled to work alongside our partners at Purina, another organization that believes people and pets are better together and is committed to providing survivors of abuse with co-living options that will keep families safe and whole." "As pet lovers and pet care experts, we feel a very personal responsibility at Purina to help create a better world for pets and people to share. I can't imagine leaving my dogs in a dangerous or abusive situation, and domestic violence victims shouldn't have to make that decision," said Nina Leigh Krueger, president of Purina. "By working with URI on this amazing project and many others, we hope to set a new standard of care for domestic violence survivors that is centered around keeping pets and people together when they need each other most." URI architects and Purina pet behaviorists and designers are collaborating throughout the planning process to ensure that every aspect of PALS Place is as welcoming, safe, and healthy as possible for families and their pets adjusting to life in the shelter. This includes everything from choosing paint colors that are pleasing to pets' eyes to selecting pet-friendly flooring, wall coatings, furniture, lighting, and window screens. To further accommodate pets' needs, Purina will provide each resident with a welcome kit containing complete and balanced Purina pet food, treats, toys, and critical supplies like crates, beds, water bowls, collars, leashes, grooming tools, Tidy Cats cat litter, and litter boxes. Dogs and cats with digestive health challenges resulting from stress will, upon a veterinarian's prescription, receive FortiFlora, a probiotic supplement made by Purina that will help rebalance their digestive systems and promote a strong immune system in their new environment. Residents will also receive free, coordinated medical services for their pets courtesy of Purina, such as wellness exams and vaccinations. 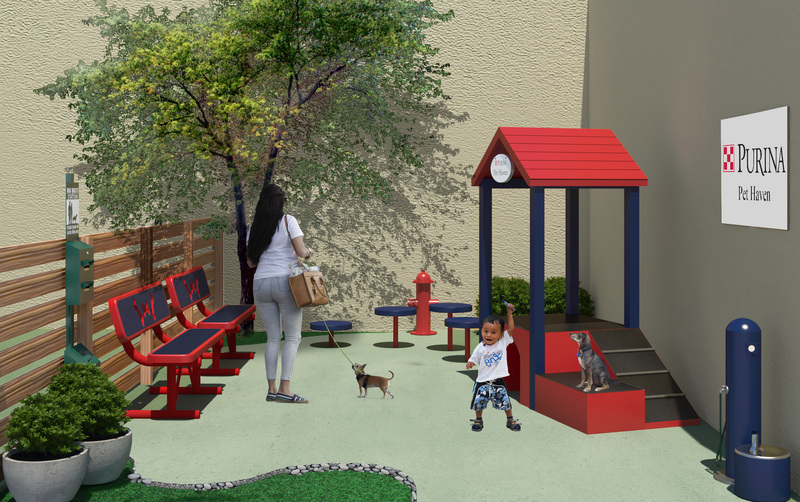 To encourage the exercise, play, and bonding time that is vital to pets' health during times of transition and stress, an outdoor "Purina Pet Haven" play area will be built on-site featuring artificial turf and play equipment. 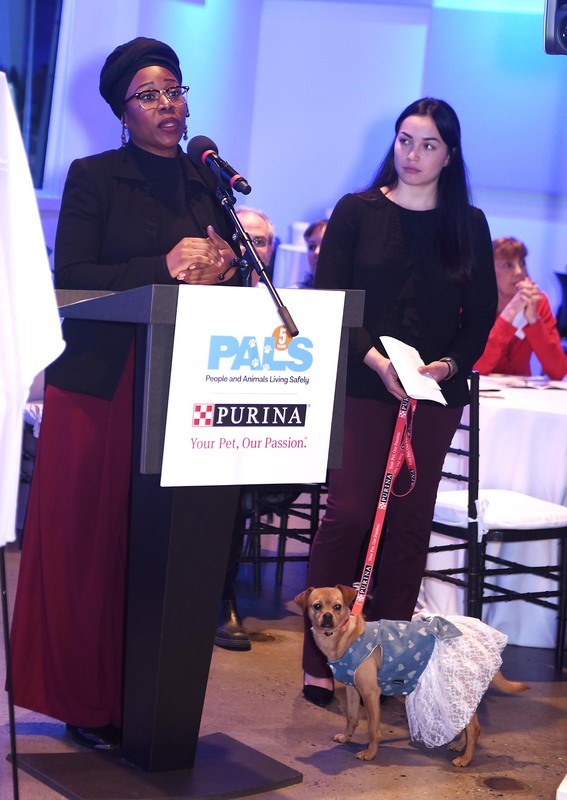 URI and Purina announced the development and construction of PALS Place during a jointly-hosted panel discussion. The panel included national experts in the domestic violence and animal welfare spaces discussing the often misunderstood role pets play in abusive situations and how to create an ecosystem of services that protect both families and pets experiencing abuse modeled after URI's PALS program. With the addition of PALS Place, URI's PALS program will span six facilities throughout New York City, providing more than 100 pet-welcoming units for domestic violence survivors and their pets. To date, URI has welcomed over 100 pets into its residences, including dogs, cats, turtles, birds, guinea pigs, lizards, and fish. URI and Purina are committed to benefitting survivors and pets on a national scale, and are currently collaborating to create a resource-based tool kit for other domestic violence shelter providers looking to make their own facilities pet-inclusive. The two organizations are also working together on an ongoing basis to advocate for the PAWS Act (Pets and Women Safety) on Capitol Hill, a bill that aims to help programs provide shelter and housing assistance to domestic violence victims' pets and urges states to allow pets to be included under protection orders. For more information about URI's services and to donate to support the mission of PALS, please visit http://www.urinyc.org. Urban Resource Institute (URI) is a leading non-profit organization that provides comprehensive, holistic, and supportive social services that aid and empower New Yorkers in times of crisis. URI's programs provide care for survivors of domestic violence, individuals with developmental disabilities, homeless families, and other at-risk populations, allowing them to live in safety and recover from trauma in both residential and non-residential settings. 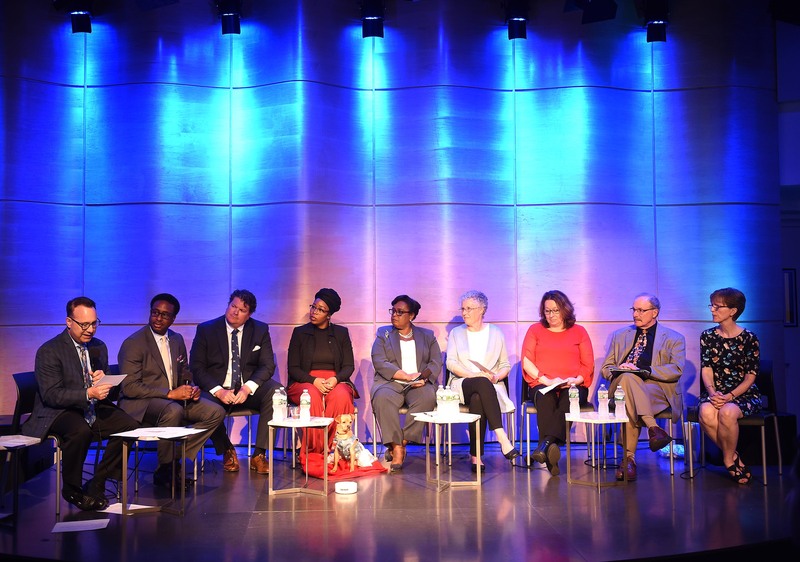 With deep community relationships and a flexible, innovative approach to program development and service delivery, URI is uniquely equipped to provide solutions to the challenges affecting New York City's most vulnerable populations. URI is merging with the Center Against Domestic Violence, the first licensed provider of domestic violence shelter in New York. With nearly 80 years of combined experience, the organization will be the largest provider of domestic violence residential services in the country, with the ability to shelter over 1,000 individuals, including survivors and their families, on any given day.